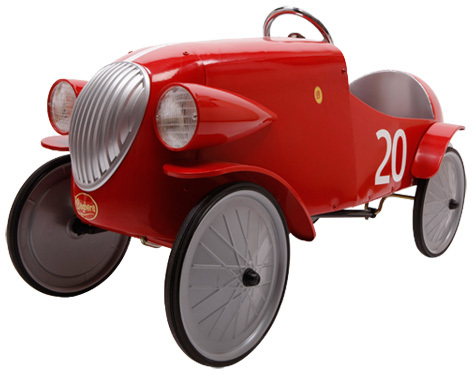 There’s no finer range of retro-inspired children’s pedal cars than those made by French company Baghera. Using expert designers, the style of these older vehicles has been captured in a large range of vehicles that can be handed down through generations of children. With a steel chassis and body panels, Baghera pedal cars are really built to last! Baghera cars capture the excitement of Le Mans sports car racing with some retro designs finished in red, green or grey to re-live the glorious racing pedigrees of Ferrari, BRM and Mercedes. What little boy or girl wouldn’t love to own a Baghera speedster, available in so many different versions? The police car and fire truck are particularly popular - with the aeroplane, jungle and riverside cars not far behind. In the 1930s there were some great classic cars produced, and Baghera pedal cars of these vintages are finished in many different colours such as blue, green, red and even pink. These vehicles are superbly well finished and offer great play value and fun for the lucky drivers.